..... Webmaister, your website brings back so many childhood memories. 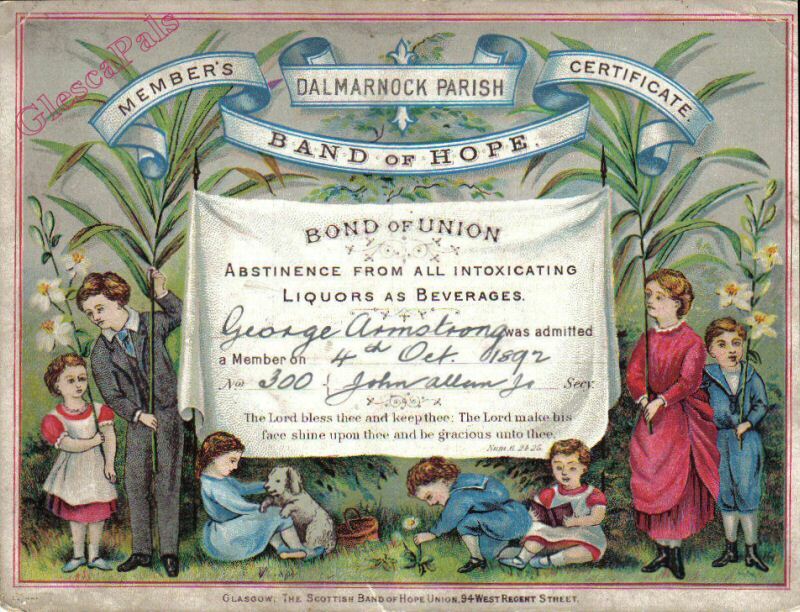 My father was born in Springfield Road in 1904 and this '1892 Band of Hope' certificate from the Dalmarnock Parish Church belonged to my grandfather, C.George Armstrong. Jim Armstrong was given the Band of Hope certificate and the church postcard about 3 years ago after the death of a maiden aunt, who had lived in the family home in Belfast until it was pulled down. His grandfather, George Armstrong was born in Co. Cavan in 1881 and moved at a young age, first to Belfast and then to Glasgow, he was only 11 when he received the above certificate from the Band of Hope. George lived at 76 Springfield Road, Dalmarnock, Glasgow and married a girl called Barbara Stitt. They moved to 159 Springfield Road where they had four children. One of the children, Jim's father, was born in 1904 the 3 other children were also born in Glasgow 2 of whom survived and around 1916/17, the family returned to Belfast. Jim's father started work in the H &W shipyard at the age of 13 and was there until he was 72 yrs old! He passed away in January 1979 at the age of 74. The grandfather George Armstrong born 1881died in December 1937.
more Band of Hope stories frae GlescaPals. I attended Dalmarnock Parish Church and was a member of the Girls' Guildry and the Sunday School. I still have one of my prizes for good attendance. The book is in VGC considering it is over 60 years old!! I remember vividly when I was about 4 or 5 being lifted on to a table to sing "Still The Night" when the Sunday School was entertaining at an Old Folk's Home. Then, when I was about 8, I had to recite a poem at the Christmas Concert. The poem was called "My Dolly's Pocket" and my mother sewed tiny garments for a lovely baby doll, and the clothes matched mine - right down to the wee pocket on the dress. After the concert, the doll was taken off me, and I didn't see it again until Christmas morning - when magically, Santa returned it to me!!!! If you have any church photographs please get in touch with me.